This is my favourite time of the year in Mexico City. Spring is here, mornings are still a bit fresh but then you have sunny, warm days and breezy nights. You can enjoy sitting in the garden once more and appreciate how nature is renewing itself, new foliage, new blooms and new growth. My fragrant small herb garden awaits picking and is often a vital complement to most of my dishes. This is the time when I start craving lighter, fresh cold soups. Cilantro is the herb of election here in Mexico. I love its versatility and never thought it could be used in such a wide variety of dishes. In Portugal we have a very typical cilantro soup which I loved as a child and was one of the few I agreed to eat. It is nice how sometimes you find familiar tastes in different parts of the world. That is one of the things I love about travelling. I would usually avoid avocado in Europe as I always viewed it a bit heavy but here I have learned to appreciate its healthy benefits. With a high content of Vitamin E it is believed among other things to fight the aging of our cells, what could be better? With time I have learned how it can be used as a complement for salads, soups and a wide variety of other dishes. As long as you don’t add too much fat to it, avocado is a great fruit. 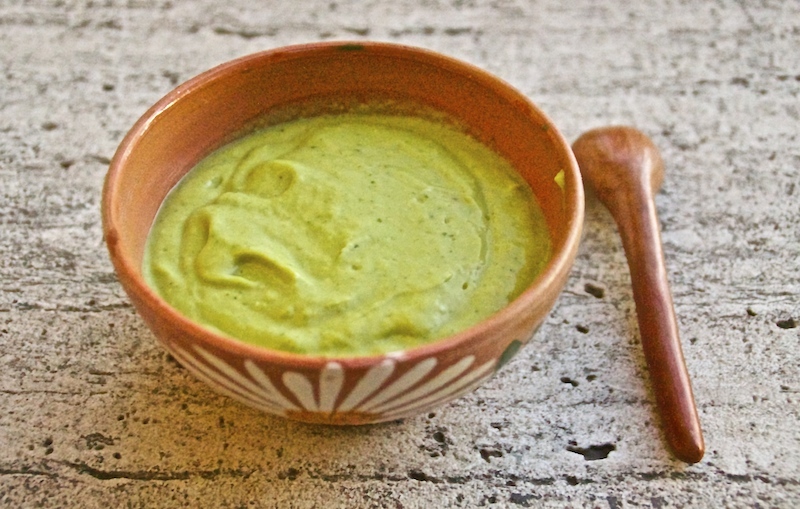 Which brings me to this silky, smooth healthy Mexican avocado cold soup. The only added fat is a tablespoon of extra virgin olive oil to cook the onion and the chile serrano for a few minutes. The chile will give the soup a nice spicy touch that adds to the flavour. I did not take the seeds or veins out of the chile but if you are afraid it will be too spicy, you can do that. The other ingredients are soft tofu and low fat or skimmed (and lactose free in my case) milk. It is such an easy and fast recipe too. If you feel the soup is too thick for your taste, you can always add a bit more milk. In a pan heat the olive oil and sauté the onion and chile serrano until slightly golden. Remove and add to a blender with tofu, avocados, cilantro leaves and milk. Blend until creamy and smooth. Add the salt and pepper and refrigerate for 1 hour. Remove from the fridge and serve cold decorated with the extra cilantro leaves. Enjoy!